Adapted from “The Enduring Power of Anchors,” first published in the Negotiation newsletter, October 2006. 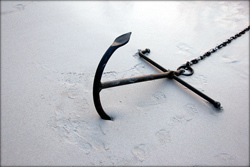 In the Negotiation newsletter, we have reviewed the anchoring effect—the tendency for negotiators to be overly influenced by the other side’s opening bid, however arbitrary. When your opponent makes an inappropriate bid on your house, you’re nonetheless likely to begin searching for data that confirms the anchor’s viability. This testing is likely to affect your judgment—to the other party’s advantage. Psychologists Amos Tversky and Daniel Kahneman identified the anchoring effect in 1974. Participants watched a roulette wheel that, unknown to them, was rigged to stop at either 10 or 65, then estimated the number of African countries belonging to the United Nations. For half the participants, the roulette wheel stopped on 10. They gave a median estimate of 25 countries. For the other half, the wheel stopped on 65. Their median estimate was 45 countries. The random anchors dramatically affected judgment. Since then, dozens of studies have examined anchoring. In a new analysis, Chris Guthrie of Vanderbilt University Law School and attorney Dan Orr integrate what we’ve learned. On average, for every dollar increase in an initial anchor, the final settlement rises by 49.7 cents. Among seasoned negotiators, with every dollar increase in an anchor, the final agreement rises by 37 cents. Finally, even highly unreasonable anchors greatly affect outcomes. The lessons: Reject the relevance and appropriateness of your counterpart’s anchor—and consider how a different anchor might affect you. Newer PostWhat's the barrier to entry in the daily deal space?